The 8th World Scout Jamboree was held in 1955 and was hosted by Canada at Niagara-on-the-Lake, Ontario. The Jamboree saw the introduction of the World Membership Badge which is still worn on the uniforms of Scouts the world over. This was the first World Jamboree to be held in the Western Hemisphere (indeed, the first outside of Europe). The Jamboree was heralded by a commemorative stamp issued in 1955. The setting was a rolling parkland on the Commons of Fort George National Historic Site. More than 11,000 Scouts from 71 countries and colonies attended this gathering, which was notable for the number of Scout contingents that crossed the Atlantic by air to attend - 1,000 from Great Britain alone. There are some incredible tales of the efforts made by Scouts to attend the Jamboree, with the New Zealand contingent leaving 4 months ahead of the event and traveling over 30,000 miles on the way. There were also three Brazilian Scouts who arrived after traveling by jeep from their hometown. 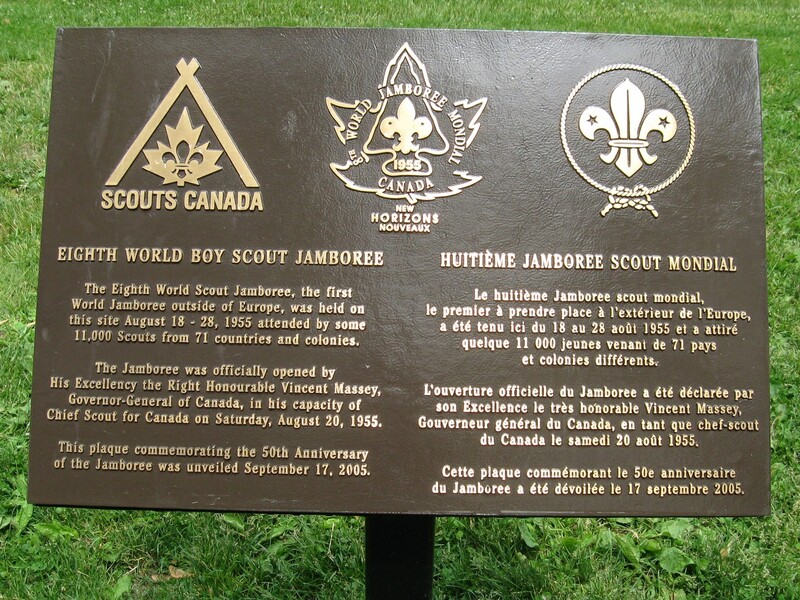 The 50th Anniversary of the Jamboree was celebrated in September of 2005 at which time a plaque commemorating the event was unveiled. The Niagara Parks Commission also planted a memorial oak tree. ↑ Walton, Mike (1999). "The World Crest Badge...(and why do we *all* wear it?)". http://www.mninter.net/~blkeagle/crest.htm. Retrieved 21 December. This page was last edited on 13 February 2018, at 12:43.